BOULDER, CO--(Marketwire - Oct 26, 2012) - According to the latest E Source benchmark study, the top-rated U.S. and Canadian electric and gas utility business websites belong to Xcel Energy, CPS Energy, and LG&E and KU. In our first benchmark study of utility websites from the business customer perspective, we found that small and midsize business customers are generally pleased with the service offerings and usability of the websites. Business customers use their utility's website primarily for billing- and payment-related transactions, and overall, utilities deliver well on those features. Common positive attributes are that the websites were easy to use, clear, straightforward, and fast, and that the sites had good navigation. Negative comments were largely related to poor navigation; the need for bigger, darker fonts; a desire for more options; and general difficulty of use. "It's really important that utilities get the basics right," says Stephanie Spalding, research manager and author of the report. "The number one feature business customers most want from their utility website is the ability to view their current bill online. Utilities that can deliver well on the billing and payment features will see an increase in web satisfaction. Checking the account balance, viewing payment and billing options, and paying the bill were the next most demanded features, after viewing the current bill." Using information from the study, utilities can benchmark how their organization's website compares with those of their peers, determine what works and what needs improvement, and -- perhaps most important -- better understand business consumer needs and experiences. "Even in a noncompetitive industry like regulated utilities, the bar continues to be raised by what customers experience on other websites, such as their bank site, travel, or retail site," says Richard Goodwin, manager of Customer Experience Services at E Source. "Continuous research and improvement of utility websites is critical to providing the optimal online experience." Regional rankings are as follows. Complete rankings are shown in Table 1, which appears below. Northeastern U.S. Duquesne Light is the top-ranked utility in the eastern region, followed by Con Edison and First Energy, which earned second- and third-place rankings in the region, respectively. Midwestern U.S. Alliant Energy captured the top rank in the midwestern region. MidAmerican Energy and Vectren rounded out the top three. Southern U.S. CPS Energy ranks highest in the southern region followed closely by LG&E and KU Energy. Florida Power & Light earned the next highest score for the region. 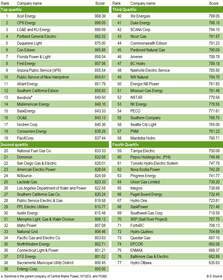 Western U.S. Xcel Energy earned the top rank in the western region, followed by Portland General Electric and APS. Canada. SaskEnergy, BC Hydro, and Énergie NB Power are the top-performing Canadian utilities. For more information about this comprehensive study, please visit www.esource.com/Web_Review_History. For 25 years, E Source has been providing unbiased, objective research and advisory services to over 300 utilities and large energy users. Our energy experts have answered more than 8,000 questions over the past 3 years. This guidance helps our customers advance their efficiency programs, enhance customer relationships, and use energy more efficiently. Functionality and average usability ratings were combined with equal weighting to determine the overall performance index, which has a maximum possible value of 1,000. The websites were then ranked in descending order. Source: Forthcoming "What Business Customers Want from Their Utility Website: Results from the Business Website Review 2012." Charts and graphs extracted from this press release must be accompanied by a statement identifying E Source as the publisher of "What Business Customers Want from Their Utility Website: Results from the Business Website Review 2012." No advertising or other promotional use can be made of the information in this release without the express prior written consent of E Source. Table 1: 2012 Performance Ranking of U.S. and Canadian Business Websites -- Functionality and average usability ratings were combined with equal weighting to determine the overall performance index, which has a maximum possible value of 1,000. The websites were then ranked in descending order.